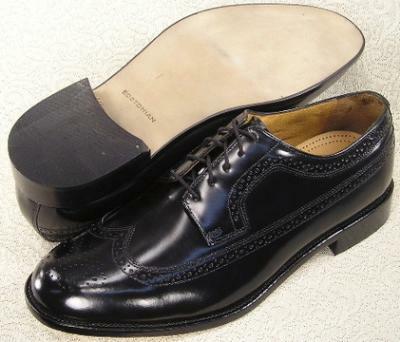 Polished, handsome and finely crafted, these dress wingtip oxfords from Bostonian are the essence of style. Smooth polished leather upper in a dress wingtip oxford style, with a rounded toe, perforated and stitched all over wingtip detailing with serrated edge accents. Five eyelet lace up front, with a smooth leather lining and a leather topped cushioned insole. Smooth flat dress leather outsole and custom rubber heel.